Over one summer weekend, a carnival troupe comes to the southern French city of Rochefort. There, they meet cafe owner Yvonne, her musical twin daughters Delphine and Solange, their baby brother BooBoo, and romantic poet/sailor Maxence. Missed connections, happy reunions, and the arrest of a notorious serial killer ensue. This film is one of several collaborations between director/writer/lyricist Jacques Demy and composer Michel Legrand. "Umbrellas of Cherbourg" is probably better known on this side of the Atlantic, but "Young Girls" is much loved in France and deserves to be better known here. Demy came out of the French New Wave but you'll see his great love for the MGM musical on full display here, especially in the casting of Gene Kelly as Solange's lover. Twin sisters Delphine and Solange are played by real-life sisters Catherine Deneuve and Françoise Dorléac. Deneuve credits her sister essentially with lighting a fire under her in terms of acting: Dorléac already had several films to her credit by the time "Young Girls" began production. The sisters don't sing their own parts, but Dorléac had been trained in ballet, which you'll see during her scenes with Kelly. A nice double bill with this film might be Bert Price's "Jazz on a Summer's Day." Both films offer freeze frames of a world familiar to many of us but completely gone in spirit. There's an ache to "Young Girls" that has to do with the evanescence of youth and beauty and the sadness of missed opportunities. Legrand's music, to my ear, was never better: the opening sequence is unforgettable. 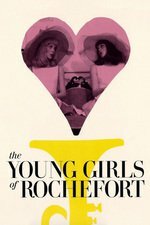 Hulu has one extra from the Criterion DVD available: "The Young Girls at 25," helmed by Demy's widow and formidable New Wave director Agnes Varda. I'm really fascinated by the "fair" that drives the plot. It's always referred to as such, and the two friends call themselves "carnies," but the only aspects of the fair we see on screen are interpretive dance numbers and the two carnies hawking a Honda motorcycle. And why is their caravan of trucks hauling boats and half-boats around? Is the fair actually just a boat show? When I was watching the fair scenes, I couldn't help but smirk. "Sign of the times...can you imagine a big crowd coming out to watch a bunch of dance recitals these days?" But then I started watching the crowd of extras by the stage, and they all seemed pretty uninterested in what was going on themselves, ha! Not sure what the deal was with the weird serial killer detour the film took. Does Young Girls At 25 get into this at all? Nice callback to an earlier Criterion On Hulu film: the mother of the twins was played by the titular "Madame de..." who hawked her earrings. Also, the blonde carny is Grover Dale, the father of actor James Badge Dale (neither of whom are related to your humble correspondent). I don't really have a lot to say about this one. For a lot of the film, I felt like Hank Hill encountering one of Bobby's new eccentric enthusiasms: "What in the world...?" Sheydem-tants, what did you think? A wonderful movie, one of Demy's best. Like Umbrella's of Cherbourg, the bright surface reflects more the desired or positive emotional state, while the plot details and dialogue suggest a darker undercurrent that can also accompany such strong emotions. In this movie the synchronized group dancing is set against another group in synchronized movement, the military, offering a sort of potential comparative for passion in excess. This is also part of the suggestion regarding the killer, Subtil Dutrouz. His passion gone sour is set against that of the would be lovers in general and that of Maxence and Guillaume, Delphine's two would be suitors. Dutrouz hints that the portrait of Delphine reminds him of the woman we find out later he killed. She too was a dancer like Delphine and Dutrouz sees something of a resemblance between them. At the dinner party there is the suggestion then that Dutrouz, when he says he thinks he's met Delphine before, is likely referring to the portrait, but could, in hindsight be understood to be referring to the woman he murdered once the fullness of that part of the story is revealed. Maxence's obsession with his unseen but known "ideal woman" is paralleled with Dutrouz's obsessive behavior through Maxence's own claim about the woman murdered "She was too big a thing in his life. ", something that could clearly be said about his obsessive search for his "ideal". Delphine's other would be suitor, Guillaume is more clearly painted as dangerous from the beginning, with his gun and attitude of superiority. But while Guillaume is at least somewhat obsessed like Maxence, his obsession is runs more skin deep and he lets it go once it is clear he can't get what he wants. Etienne and Bill share some of that interest more in surfaces than depth, but their affections are more loosely held, where pleasure is more of the moment and not something to obsess over or that one tries to hold. That attitude, in turn, is contrasted by those of the girls mother, Yvonne, her ex fiance, Simon Dame, and his friend Andy. Yvonne and Simon had a relationship that broke up over something superficial, her concern over being called Madame Dame, and Andy didn't pursue a relationship because of his passion for music and now regrets it. The movie plays with all these sorts of possible connections and their outcomes through the constant references to time; clock time, calendar time, and just through the timing of characters running into or sweeping past each other throughout the length of the film. The feeling of destiny in this takes on both its typical romantic sense of fated love, but also still suggests the opposing sense where chance can prove costly while in both, the bittersweet knowledge time is fleeting.